I know: I started this off saying I was going to talk about Glendale and here I am talking about another city. Hey, bonus! I had to eat lunch and since I'm still birthday-close and Mom let me choose the restaurant, I picked something that looked cute and book-themed. I dutifully followed Zomato's recommendation and ended up at Chapter One in downtown Santa Ana's Artists' Village section. If you haven't been over there and you're in the area, just go! It's adorable. The whole area is adorable. If you're a writer, well, of course, you must go to Chapter One. The menu features pub favorites like fish and chips with locally sourced ingredients and book-themed drinks. Draft beers are listed on a translucent lined sign by the bar with "Rough Draft" in a scrawl-like font at the top. I ordered a grilled cheese sandwich and creamy tomato soup. As Hemingway would say: it was good. My 94-year-old grandmother is currently recovering from a chain reaction that began with an infection that landed her in the hospital. It looks like she might not be able to return to her home, but we shall see. It wasn't the easiest visit. I drove through a lot of streets that I'd seen as a child growing up the in the are and my life is very different from what I ever imagined it would be like then. For a variety of reasons, I really didn't want grandma asking me questions about my life. When we arrived at the board and care, the administrator and nurse on duty both greeted us and set us up by grandma's bedside to visit. Grandma was totally passed out. Mom kept trying to wake her and eventually roused her enough for Grandma to squint at my shirt and read it, "'She believed that she could so she did.' That's true." The interaction level didn't get much higher than that. 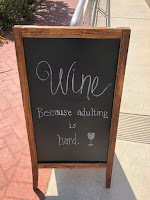 Post-visit, I needed wine, so we drove to Glendale to check-in at our hotel, the Roadway in Regalodge on Colorado St. The motel is kind of old, but decently maintained. The best part is the location: we were right across the street from the Glendale Galleria and Americana Shopping Center. After a quick loop around the shops, we landed at a wine and tapas place called Bacari GDL. Many glasses of prosecco and plates of cheese later, my graduate school friend showed up. We made our way to a wine bar in the middle of the courtyard and had more wine. We spent a lot of time talking about the status of everyone's relationships, the graduate school experience, turn-over at her job, and career theory. It was fun and stimulating, and it really makes me miss my friend more being reminded of how amazing she is. 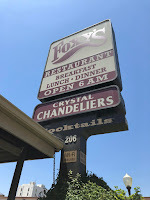 My best friend pre-3rd grade had a father who loved Foxy's in Glendale. As my mom observed, it looks like an upside-down ship with its triangular roof. The menu is basically diner far with influences from California and New York cuisine. The breakfasts feature an option for a bagel and lox, but you can also order a tuna or chicken melt, or select something from their southwest specialties. Of course, I most enjoyed the luxury of finally being old enough to order a mimosa with my breakfast at Foxy's. I couldn't do that as a second grader. After Foxy's, we drove to Ventura, walked around Main Street and revisited some old haunts. Mom used to love to go thrift store shopping. Since most of the stores are still there, I have no idea how we got away without her insisting we visit at least one thrift store. 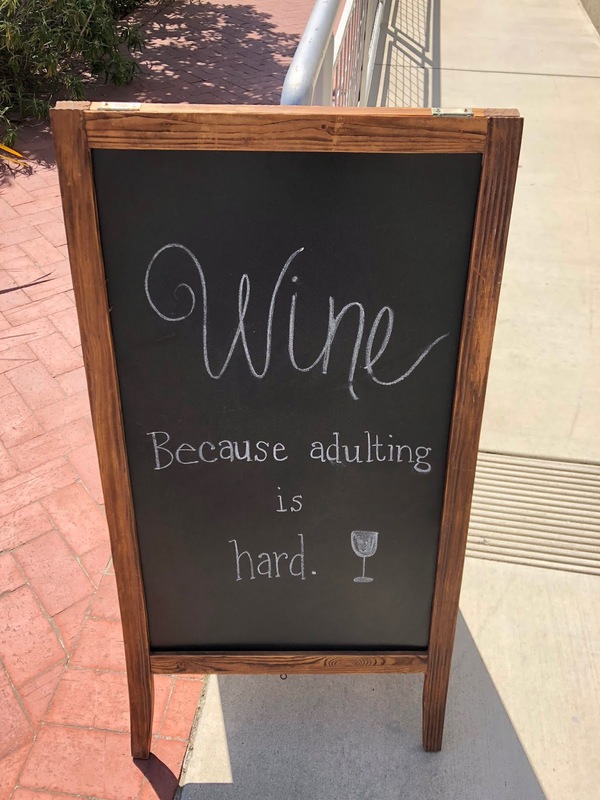 I wanted to check-out Labyrinth Winery, but they were closed. Meanwhile, mom told me she had a bathroom emergency and didn't want to grab anything at the Irish pub. So we stopped at a coffee shop in an alleyway filled with shops, but they didn't have a bathroom. Finally, I sat down to enjoy my coffee and let mom work it out. Buyer beware: public restrooms in downtown Ventura are in short supply. Summerland is a tiny town just south of Montecito. We used to order hamburgers from Stackey's Seaside or enjoy a leisurely lunch at the Big Yellow House. Both are now closed. We decided to give Summerland Winery a try. It's a lovely place to enjoy a glass of wine. They even provide a porch with comfy patio furniture and low tables. I ordered a glass of petit syrah and was not disappointed. After that, we drove through Montecito, got on to San Marcos Pass and drove through the Santa Ynez Valley. Eventually, we reached the Cracked Crab in Pismo Beach. I'm a seafood lover and this is a great place for crab! Everything was fresh, the staff were nice, and most of the food is served as bucked of deliciousness dumped on a paper-covered table and served with melted butter. Smiling staff members walked around sporting t-shirts that read, "I got crabs in Pismo Beach." The rest of our drive was in the dark, but we finally made it to our hotel in Monterey. Tomorrow, we'll probably grab some quick brunch, walk around Cannery Row a bit, and get back on the road to meet some fellow writers in San Francisco. I hope you are all having a lovely week. I'd love to hear about your favorite California spots as well.